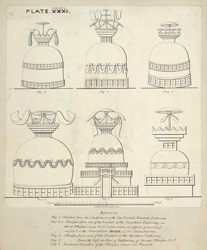 Pen and ink drawing of the elevations of six stupas from sculptures on the East, West and South gates of the Stupa of Sanchi, by Frederick Charles Maisey, inscribed: 'Plate XXVIII', with notes. The Buddhist site of Sanchi is of outstanding importance for the number and variety of its monuments and sculptures. The preserved Buddhist structures are mostly stupas (Buddhist hemispherical monuments often containg relics) built between the third century BC and the sixth to seventh centuries AD. The foundations of this monastic centre were laid by the emperor Ashoka (reigned circa 269-232 BC) who built the original Stupa 1 and erected a monolithic pillar in the third century BC near the south gateway. The stupa was later enlarged and encased in stone around the 1st century BC under the Shungas and four magnificently carved gateways called toranas were added at the cardinal points. These consist of square posts supporting three curved architraves with scrolled ends, all covered with sculptures illustrating episodes from the Jatakas (legends about the previous lives of Buddha) as well as stories from the historical Buddha. This drawing reproduces the detail of stupas carved on the lintels. Early Buddhist art was aniconic and therefore Buddha was never represented in human form; his presence was indicated by emblems such as the parasoled stupa, as seen on those in this drawing.